Chinese President Hu Jintao's admission that "a lot still needs to be done in China in terms of human rights" was a significant development but must be followed by actions, former U.S. 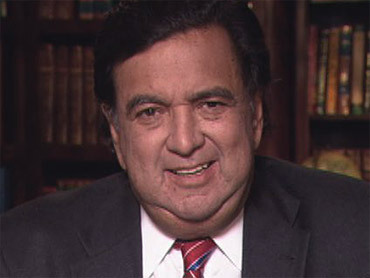 Ambassador to the United Nations Bill Richardson said Thursday. During a joint press conference with President Barack Obama before Wednesday night's lavish state dinner, Hu was challenged by U.S. reporters on China's human rights record, which includes the imprisonment of Nobel Peace Prize-winning dissident Liu Xiaobo and its long-running hostility toward the Dalai Lama over Tibetan independence. Obama: China's Human Rights Record "Source of Tension"
Mr. Obama said human rights was a "source of tension between our two governments" but Hu initially ignored the question, later claiming his translation device wasn't working. White House sources said it was. Pressed a second time, Hu said China needed to do more to improve its record. Richardson, also the former governor of New Mexico, told CBS' "The Early Show" that the comment was a positive step forward. "In the past, China has basically said that human rights is an internal affair. And I think for President Obama to get the Chinese leader to say that universal human rights are important, that China needs to do more, is significant. … But now, it's going to be deeds and not just words." Hu was feted Wednesday night at a state dinner that included poached Maine lobster, rib-eye steak and musical entertainment from Chinese pianist Lang Lang and jazz great Herbie Hancock. Richardson said the importance of the state dinner shouldn't be discounted, given the fact that Hu was offered only a private lunch with President George W. Bush during his last visit in 2006. "It's very important because China considers form and substance and protocol extremely important," he said. "Look, the reality is China and the U.S. are the lone superpowers. We're not buddies, nor [are we] foes. We're strategic competitors that need to learn to live with each other. And these, I think, shows not just political congeniality, but also pomp and circumstance and treating them with respect, letting the Chinese show their people that they're a superpower is very important. Richardson said the trip, which included a meeting with U.S. business leaders and pledges of closer economic ties - the White House was able to announce a nearly $45 billion export agreement - was a "net win" for President Obama.